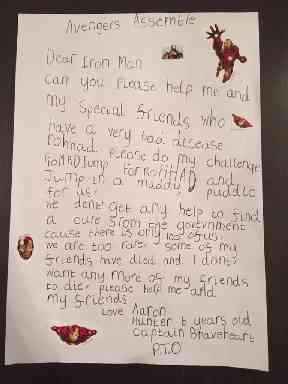 Aaron Hunter, seven, wanted Tony Stark aka Iron Man to help cure his friends. 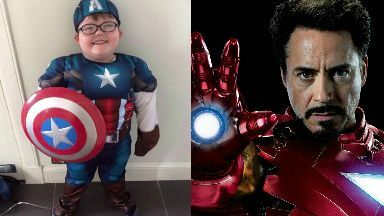 Robert Downey Jr has answered a heartfelt appeal from a young boy for his favourite superhero to help save the lives of his friends. 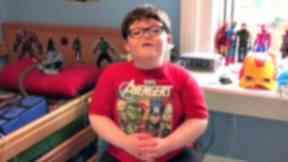 The Hollywood star, who is due to begin filming for the next big Avengers movie, surprised the young fan with a special video call after hearing of his plea for help. Aaron Hunter, seven, from Alexandria in West Dunbartonshire, had recently shared a video of himself reading a letter he had written begging the hero to help his friends. Diagnosed with ROHHAD, a syndrome that is potentially lethal and incurable, Aaron released the appeal on social media after one of his friends with the same disorder, Sedona Marie, died. "He is a very clever boy and he became very distraught when she passed," says his mother Elisabeth. "He told us that he doesn't want to die and he doesn't want us to forget him. We promised him we were doing all we could to help him and that his doctors were too. 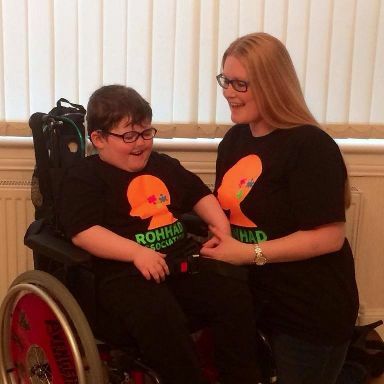 "Aaron then said to me 'mummy, I want to help the doctors for my other special friends because I don't want anyone else to die'." Determined to help her son get his message to Iron Man, Elisabeth helped him post a video online begging Avengers fans to help them. Videoing in from California, Robert - in character as Tony Stark - told Iron Man fan Aaron Hunter he was a "brave hero" for everything he had done. Hello, my name is Aaron Hunter and I need to speak to Iron Man. Iron Man if you see this I really, really need your help. I have a very bad disease called ROHHAD and it's really hard sometimes because it is rare. The doctors don't have a cure yet. Some of my friends with ROHHAD have died. I don't want any more of my friends to die. We need your help Iron Man. I am trying to raise awareness and money to help my doctors find a cure. Iron Man I had an idea last year and I need your help. I wrote a letter to you and all the Avengers, but I don't think you got it because you haven't done my challenge yet. ROHHAD is evil and I need your help to defeat it. I really want to save my friends. Can you please help me and do my 'go mad jump for ROHHAD' challenge. Loads of other people have done it. I have loved watching their videos but we still don't have enough money so I really need your help. My mum says you might be coming to Scotland soon. Can you please come and see me so I can talk to you about it? I really, really need your help. Please help me Iron Man. I love you and I want to become a superhero like you. "He called us and the timing was a complete surprise," says Elisabeth. "He's not yet on set filming the Avengers in Scotland but he said he didn't want to wait to speak to Aaron. "He was in character as Tony Stark and Aaron absolutely believes that he has spoken to the real Iron Man." She added: "The pair of them chatted for about half an hour and he really was so sweet to him. "He made Aaron feel very special and he told him that he was a hero." Aaron, who has since been admitted to hospital to undergo more tests, has nevertheless spent every moment since with a big smile on his face for his new "best friend Iron Man". "To him the characters are real, he doesn't quite grasp the whole actor thing," says his mother. "He doesn't know of Robert Downey Jr, he just believes there's a Tony Stark. "He believes so much in them and I don't want to take that magic away from him, especially now with everything he's going through." A very rare syndrome, affecting approximately only 75 cases worldwide, ROHHAD is a life-threatening disorder that presents in children after the age of 1.5 years old. The term ROHHAD is an acronym for Rapid Onset Obesity with Hypothalamic Dysfunction, Hypoventilation and Autonomic Dysregulation. Described as "a cruel and complex disorder" it severely impacts quality of life. For some sufferers, the condition can be terminal and children living with ROHHAD face a daily fight for survival. 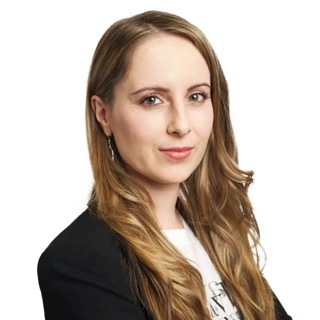 "The chance of Aaron developing ROHHAD was one in 73 million," says Elisabeth. "The past few years have been incredibly difficult for him as it has taken its toll on his body. "He has spent more than two years in and out of hospital battling to survive in Intensive Care, having various invasive investigations, and surgeries. "He has gone from a healthy toddler full of life and energy to using a wheelchair, taking various medications and injections and also relying on a ventilator and oxygen to survive each day." A video call from his beloved superhero, says Elisabeth, has been vital in helping her son fight through the disease. "He said it made his whole life and it was just the best day ever, ever," she says. "His doctors have said they're so proud of him and are a little bit jealous because they're all Avengers fans." Thanks to the team at Marvel and the charity When You Wish Upon a Star, Aaron was also recently invited on to the set of the new Avengers film while it is being filmed in Scotland and was able to meet Captain America (Chris Evans), Falcon (Anthony Mackie) and Black Widow (Scarlett Johansson). Aaron is now hopeful he will be able to spend more time with his best friend Iron Man in the future. The hero has also made a promise to Aaron to fulfil his charity challenge to jump in a puddle to raise funds for research into ROHHAD, a task already taken up by Scotland's First Minister Nicola Sturgeon - known as "the big boss of Scotland" to Aaron. Elisabeth says he was delighted when Tony Stark said he promised to jump in a puddle to raise awareness too for his #Gomadjumpforrohhad challenge. "Research is vital if we are to find a cure for Aaron and all the other children with this terrible disease," she says. "I couldn't care less about winning the lottery or anything, I just want more time with my son. "I'm just so proud of him. He's just so special. "We'll never forget this call from Robert, it's etched in our memories forever."